The History Department will host a workshop on Developing Statements of Teaching Philosophy on Tuesday, May 20, 2014 from 10:00 a.m. to 1:00 p.m. to be held in the Walsh Library Electronic Information Center (Computer Lab 044). Light refreshments will be available before the workshop with lunch to follow. Dr. Paul Beaudin, Associate Dean of the School of Arts and Science and Associate Professor of Education at Iona College, will offer a 3-hour workshop for graduate students. The workshop will begin with a presentation on curriculum and pedagogy and then lead to discussions on the work of several educational theorists. Participants will conduct on-the-spot, online research, discuss teaching philosophies with faculty and fellow graduate students, and then write and receive feedback on their own statements of teaching philosophy. If you have already written a statement of teaching philosophy, please come and refine it further. If you haven’t already written a statement, you will leave this workshop with a good working draft. Either way, this workshop will develop your grasp of the philosophy of teaching and further prepare you for the job search and interview process. Please come and participate in this important department workshop. History major Dylan DeMartino has long been interested in international economics and Latin America. He combined hose interests to produce an article in the most recent Fordham Political Review. 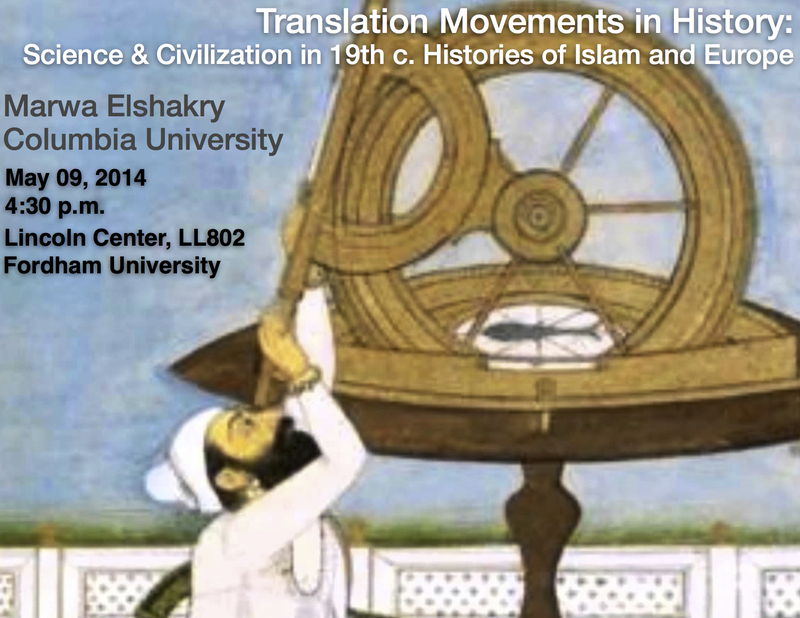 We are delighted to hold our third HSTEM seminar with Dr. Marwa Elshakry, of Columbia University. On Friday, May 9 at 4:30 PM in LL802 on the Lincoln Center Campus, Elshakry will discuss her paper “Translation Movements in History: Science and Civilization in Nineteenth Century Histories of Islam and Europe”. The commentator for this session will by Dr. Durba Mitra (Fordham History), who works on gender and medicine in South Asia. Attached below please find the seminar paper for discussion and a poster for distribution as widely as possible. We look forward to seeing you on Friday!